Handcrafted Turquoise Jewelry from the Southwest, U.S.A. regions is unique from any other Jewelry in the world. There is definately a style and look that Turquoise Jewelry has that comes from this area and Handcrafted Turquoise Jewelry is standard in Sterling Silver. Handcrafted Turquoise Jewelry is made by Southwestern Native American Indians, Contemporary Southwest Jewelers and Turquoise Jewelry Manufacturers in Arizona, New Mexico and Colorado. 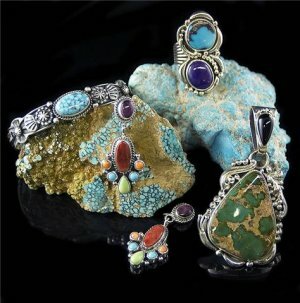 Durango Silver Company of Durango, Colorado U.S.A is one of the leading "quality" Handcrafted Turquoise Jewelry produces in the Four Corners area. 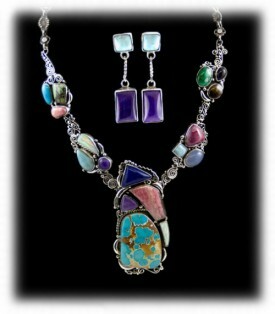 We specialize in high grade American Turquoise set in exquisit handcrafted Sterling Silver designs. We take pride in providing unusual designs of high quality Southwestern Turquoise Jewelry that is sold only by our company. We have a historic Trading Post in Durango and we sell Online in from our store. Above are two unique pieces of that were produced by Durango Silver Co. The multi-gemstone Handcrafted Turquoise Necklace on the left was made with Turqoise, Sugilite, Rhodocrosite, Lapis, Ruby and Ivory. 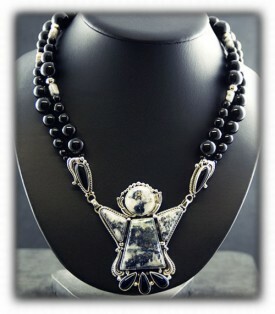 It is very unusual and absolutely a one of a kind. On the right is a Handcrafted Silver Ore Necklace, the Sildver Ore if from Silverton, Colordo and the silverwork is exquisit. Silver Ore is seldom scene and is beautiful, Durango Silver has a good supply of Silver Ore from several differant mines in Colorado, California and Canada. Both the Handcrafted Turquoise Necklace as well as the Silver Ore necklace have been made by John Hartman of Durango Silver. 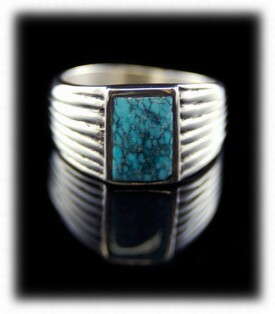 Above are two Mens Turquoise Rings produced by Durango Silver Co. The handcrafted Turquoise Ring on the left has a Dry Creek Spiderweb stone and was made in silver and 14k gold. The handcrafted Turquoise Ring on the right is a classic Mens Turquoise Ring that was handcrafted with beautiful Spiderweb Turquosie. Mens handcrafted Turquoise Rings are a specialty of Durango Silver Company and we always have a lot handmade silver rings to choose from. 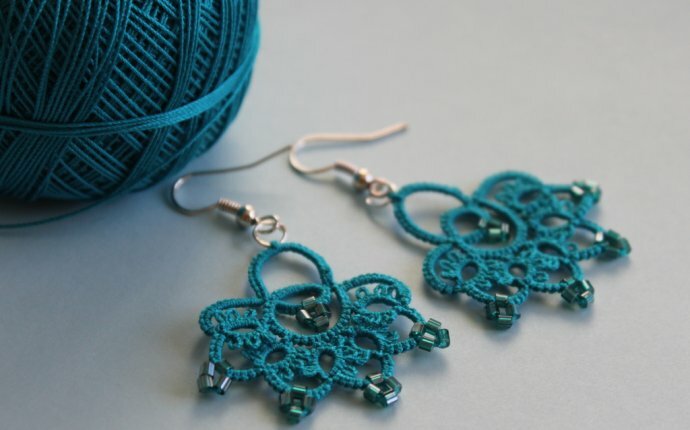 What great examples of handcrafted Turquoise Jewelry these are. 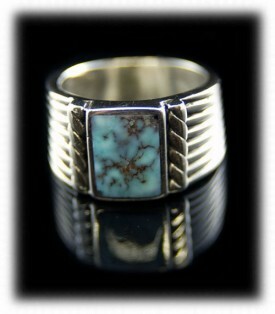 Quality Handcrafed Turquoise Jewelry is what Durango Silver Company is known for. The bracelet on the left was Navajo handcrafted and has a Broken Arrow Turquoise stone. 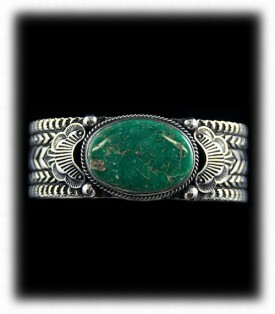 Notice the heavy stampwork Navajo Silversmiths are known for, this is a Mens Turquoise Bracelet. The Handcrafted Turquoise Bracelet on the right has Bisbee Inlay Turquoise Stones and was produce by Durango Silver Co. The two pieces of art above are great examples of handcrafted Turquoise Jewelry made in America. You can check out a lot more examples of handcrafted silver jewelry on our handcrafted silver jewelry presentation page. Thank you for reading a little about Handcrafted Turquoise Jewelry, we hope you have learned something from this presentation page on handcrafted Turquoise jewelry.